Will these geniuses ever smarten up? Has the The Big Bang Theory TV show been cancelled or renewed for a 12th season on CBS? The television vulture is watching for the latest cancellation and renewal news, so this page is a dedicated place to track the status of The Big Bang Theory season 12. Bookmark it, or subscribe for the latest updates. Remember, the television vulture is watching your shows. Are you? Airing on the CBS television network, The Big Bang Theory stars Johnny Galecki, Jim Parsons, Mayim Bialik, Simon Helberg, Melissa Rauch, Kunal Nayyar, and Kaley Cuoco. The sitcom revolves around a group of brilliant scientists who are still somewhat socially inept, despite their progress over the years. 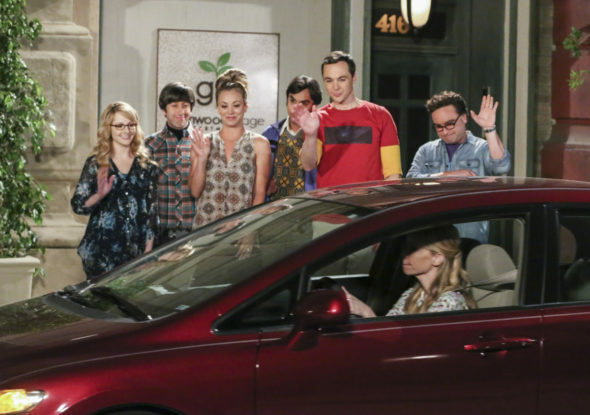 The 11th season of The Big Bang averaged a 2.74 rating in the 18-49 demographic and 14.04 million viewers. Compared to season 10, the sitcom is down by 12% in the demo and even in viewership. Find out how The Big Bang Theory stacks up against the other CBS TV shows. On March 20, 2017, The Big Bang Theory was renewed through season 12 which will debut on September 24, 2018. Stay tuned for updates. Despite declining ratings throughout the years, The Big Bang Theory remains a very strong player for The Tiffany Network — even in the coveted 18-49 year old viewer demographic. It is also quite profitable in syndication. Although we don’t have to worry about an imminent cancellation, I’ll still keep an eye on the ratings and update this page as needed. Even the most successful TV shows have a shelf life. Subscribe for free updates on any Big Bang Theory cancellation or renewal news. Check the rankings for the other CBS TV shows. Read other The Big Bang Theory TV series news or other CBS TV show news. What do you think? Are you happy CBS has renewed The Big Bang Theory TV through its 12th season? How would you have felt if CBS had cancelled this comedy TV series, instead? The Big Bang Theory: Cancelled or Renewed for Season 11 by CBS? I say go with season 12. This is the most funniest show. I am so glad that I discovered this show! I have two mathematicians at home and I see them on this show. I think it has to cancel that show, because there are no more seasons of the big bang theory. who cares about season 12? it’s nothing like cheers. I am glad they have renewed this series. There are very few truly funny shows Many think they are but they are not at all. The cast has good chemistry and it truly is a good show for young and older adults. I would like to see it renewed again. They need not to try so hard at the story line and go back to why they became successful in the beginning.